A computer can be viewed from many different levels, and used for many different functions, such as the creation of new application software. However, an actual computer works at an even lower level than this. 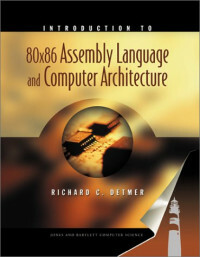 Introduction to 80x86 Assembly Language and Computer Architecture divides its emphasis between the assembly-language/machine-language level of computer operations and the architectural level, that is, the level defined by the machine instructions that the processor can execute. Although the primary architecture covered is the Intel 80x86 family, each chapter does include information about other architectures, or computer levels. Programmers are expected to program effectively at any level, therefore, Introduction to 80x86 Assembly Language and Computer Architecture is essential to the fundamental principles at the machine level that they will have to understand. Programming in assembly language and studying related concepts in Introduction to 80x86 Assembly Language and Computer Architecture prepares the student to program effectively in any programming language, to pursue advanced studies in computer design and architecture, and to learn more about system detail for specific computers.